1.Boas – Everyone wants to unleash their inner diva, so wrap up that feather boa and strike a pose! 2.Sunglasses – Sunglasses come in all shapes and sizes, and wearing them at night is the cool thing to do. Don a pair of stunner shades, the classic party sunglasses, or even the over-sized version and make a photo booth fashion statement! 3.Moustache – Whether you want the traditional Tom Selleck look or the evil mastermind pencil thin moustache, sporting a ‘stache is a great way to liven up your photos. 4.Hats – Just like moustaches, hats come in all shapes and sizes – from rainbow ten gallon hats to crowns and even a chicken, policemen’s hats to traffic cones, there’s a hat for everyone! 5.Wigs – Now we also believe wigs are a class of their own. Don a purple flapper wig, or a classic 80s hair band wig – whatever you do, own that look and make it yours! 7.Picture frames – Grab an empty picture frame and pose for a picture inside of another picture! Very arty! 8.Thought bubbles – A thought bubble is a great way to incorporate an unheard thought into the photo and can have hilarious results! 9.Masks – Sometimes you want to be seen, other times you want to make a scene. Either way, a mask is a great way to make those viewing the photos take a wild guess of who is under the mask. 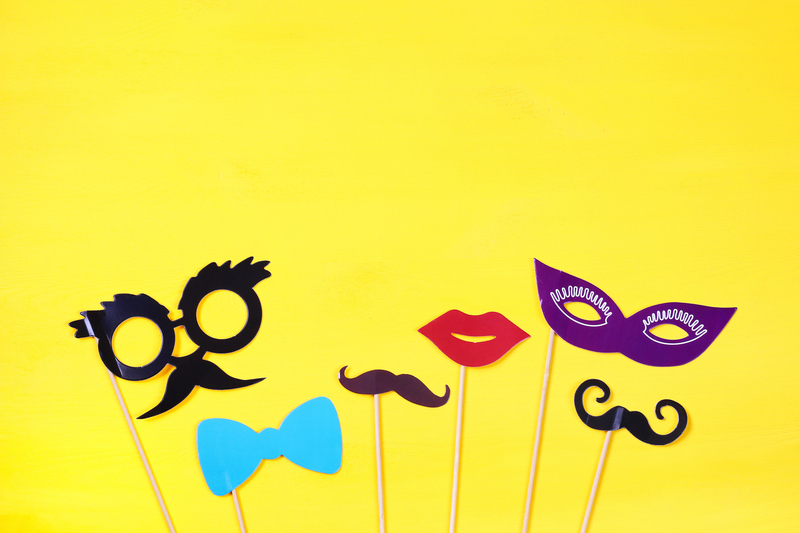 10.Random Items – some of the best photo booth props are completely random and a surprise even to us. Whether it’s a potted plant, an item of clothing or even a personal camera taking a picture during the picture, whatever prop you can think of, bring it in! And remember – the more creative you are when coming up with props, the more creative your pictures will be as you remember the great time you had during the wedding or event! If you’re looking for more information about renting a photo booth in Yorkshire for your wedding or special event, get in touch with Into the Booth today by emailing intothebooth@hotmail.com, messaging on our Facebook page www.facebook.com/intothebooth or through our booking/contact system on here. Photobooth Props are so much fun!